Gerald Thomas, a C.A. Swanson & Sons executive, had a big problem. What to do with about 270 tons of left over Thanksgiving turkey. “After Thanksgiving, Swanson had ten refrigerated railroad cars — each containing 520,000 pounds of unsold turkeys — going back and forth across the country in refrigerated railroad box cars, because there was not enough storage in warehouses. We were challenged to come up with a way to get rid of the turkeys,” said Thomas. 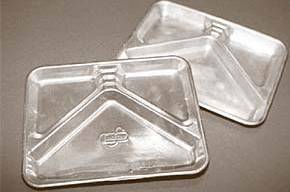 He got the breakthrough idea from the trays used for airline food service. And the TV dinner was born. The first production order was for 5,000 dinners, thought to be a big gamble at the time. They had about two dozen women armed with ice cream scoops filling the new trays at night. The first TV dinner featured turkey, corn bread dressing and gravy, buttered peas and sweet potatoes. It cost 98 cents and came in a box resembling a TV. The 5,000 dinners proved to be a gross underestimation. Swanson sold 10,000,000 of them that year. Of note, most folks didn’t own freezers back then, so the dinners were bought and prepared the very same day. In 1962 they stopped calling them TV Dinners.